After you get hit in a car wreck, you deserve three types of compensation: 1) compensation for your injuries; 2) compensation for the damage to your car; and 3) compensation for the diminished value of your car. Unfortunately, most people don’t know that they can make a car accident diminished value claim, so they are tricked into receiving less compensation than they deserve from the insurance company. To get fully compensated after you’ve been in a car crash, you’ll first need to prove that your vehicle has diminished in value. The first step in doing so is getting your car repaired. Once your car has been fixed, you can hire a professional appraiser to determine what the car’s current value is. Next, get an idea of what the vehicle was worth before the accident by reviewing a source such as the Kelley Blue Book. By subtracting its current worth from its post-accident worth, you’ll get an idea of what its diminished value comes out to be. 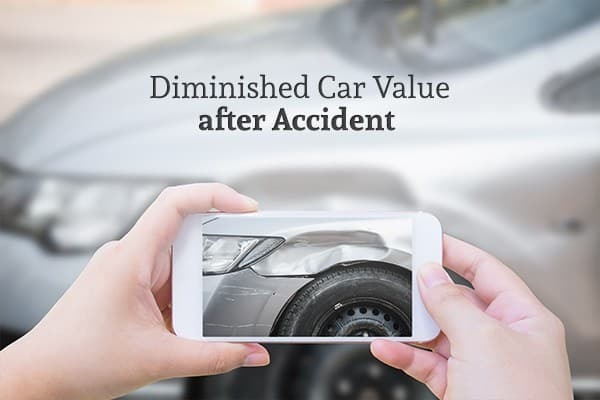 However, you’ll also need to use a diminished value calculator since a simple subtraction of the post-accident value from the original value won’t be completely accurate when calculating your car’s diminished value. Once you’ve collected evidence of your car’s diminished value, you’ll be able to present this to the insurance company at the same time that you seek compensation for your car repairs and your injuries. However, it’s important to remember that insurance companies do not want to give you the full compensation that you deserve. So before you speak to your insurance company and the insurance company of the driver who hit you, you should always contact an attorney. A personal injury attorney is skilled at speaking to insurance companies to make sure that the insurance reps don’t twist your words around to give you less money than you deserve. Your attorney will help you determine how much you deserve for your injuries and car damage and make sure that you get that much compensation. If you’ve been in a car accident, contact Machi & Associates. Our personal injury attorneys are skilled at filing car accident diminished value claims. We are also experienced at speaking with insurance companies to make sure that you don’t get less than you deserve from them. And if you need to take your insurance company or the driver that hit you to court in order to get fully compensated for your damages, Ted Machi and the rest of our team will be there for you.